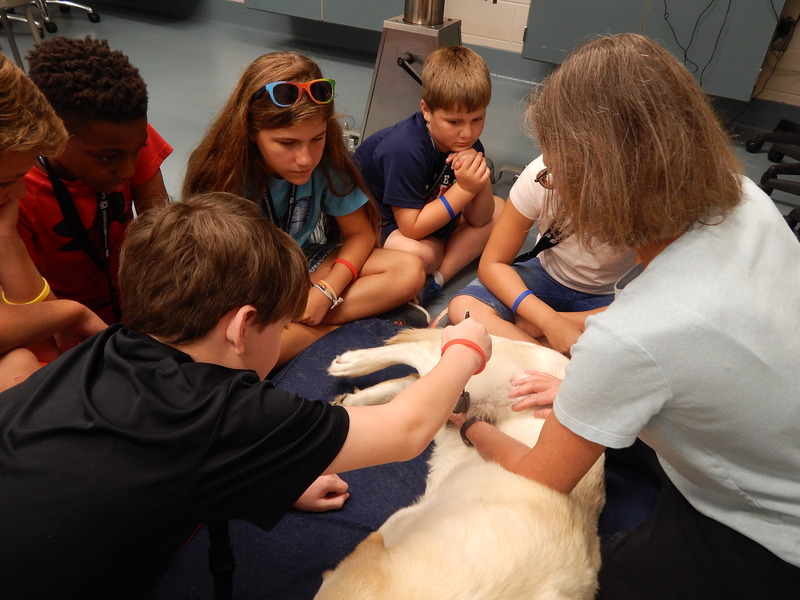 Three veterinary summer camps offer 100 youth the first-hand experience of being a veterinarian, giving them an early insight into a potential career field. Dr. Elaine Coleman, a professor in the Department and Anatomy, Physiology and Pharmacology, uses her dog to teach students animal anatomy. From 2016 Vet Camp. 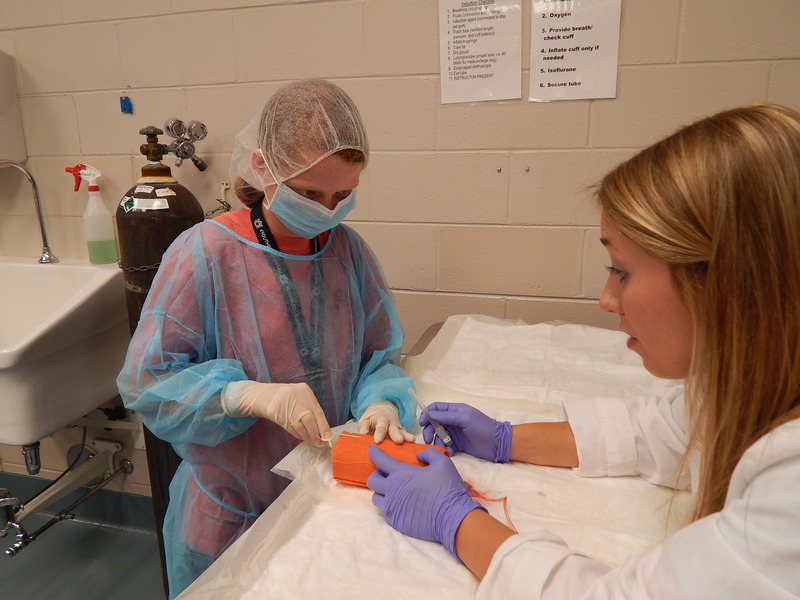 Students grades 6-12 are participating in camps at Auburn University’s College of Veterinary Medicine, in partnership with Auburn’s Office of Professional Continuing Education. The camps are popular, are booked months in advance of the deadline, and are full for 2017. Two Senior Veterinary Camps, one for 9th to 11th graders and one for high school begin June 12-16, and a Junior Veterinary Camp, for 6th to 8th graders will be July 10-14. All three Veterinary Camps are conducted by second-year veterinary students, faculty, and staff and offered to students interested in the field of veterinary medicine. Head counselors Jamie Leistner and Virginia Stilwell, both third-year veterinary students, jumped at the chance to be involved in Vet Camp this year after serving as camp counselors last year. 2016 Vet Camp counselor Rachel Burt, right, instructs a camper how to insert a needle in a pool noodle. “I was involved in Vet Camp as a counselor last year, and I absolutely fell in love with everything about it,” said Leistner, from Ashland, Ky.
Stilwell agreed. “I jumped at the opportunity. It is a privilege to represent Auburn’s College of Veterinary Medicine in this capacity and share my passion for this profession with the kids. Leistner says the goal of vet camp is “to help students grow in their passion and knowledge of veterinary medicine. They know they love animals and science, but I want to show them how much more than that there is to vet med. 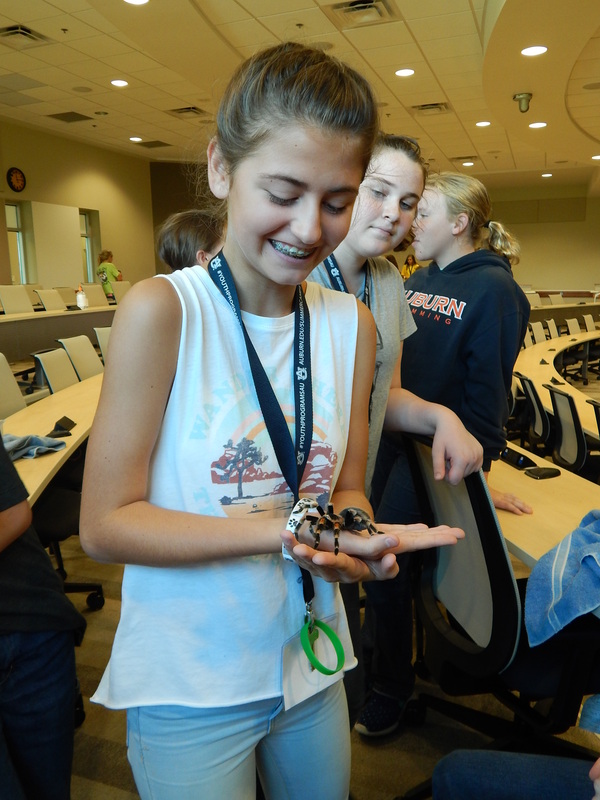 2016 vet campers learn about all animals, large and small. Students at all sessions will learn about veterinary medicine first-hand in classrooms, laboratories, and outdoor facilities. Camp participants also will learn about the college’s Southeastern Raptor Center, Canine Performance Sciences, Auburn’s detection dog program, as well as tours of the equine, dairy and beef units. They learn about public health, wildlife, anatomy, imaging, and first aid, as well as gain valuable mentoring about veterinary careers.